Emei Mountain is one of the most holy Buddhist sites in China. I’ve been harboring a desire to climb it since I read about it – the photos of foggy peaks and sweeping vistas tug at my heart. Bill and Sam decide to make a weekend of it, inviting Vega and I along. At first I was a little torn – going with a group means you don’t get to set your own pace, and you have to make small talk while you’re climbing. I put aside such (admittedly selfish) thoughts, and agreed. It’s about a three hour drive from Chengdu to Emeishan. Sam brought me a loaner coat, since I had not checked the weather, and the summit was still at freezing levels. The scenery was pretty, but also abruptly industrial. There would be long stretches of green hills and then some sort of unpleasant looking factory or dilapidated series of buildings. I did see my first terraced tea hills! My recommendation was to stay at the Teddy Bear Hotel, as recommended to me by Fodor’s guide. I immediately like the place as we enter. There are free English maps of the mountain on the counter, and the walls in the common room are coated in autographs and cartoons. They have their own restaurant, and a nice lounge. The place is a step up from a hostel, but it definitely has a backpacker vibe. The room is functional – the beds are hard and smell of cigarette smoke, but since it’s only for one night I don’t feel like pushing the issue. I really don’t like that ashy after smell, though. 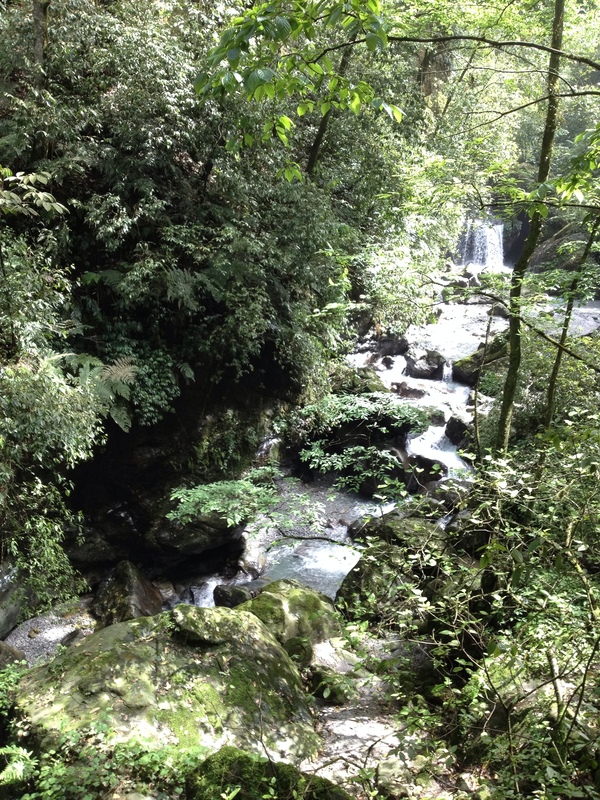 Should you ever go to Emei Mountain, I recommend the place. It’s convenient, but not particularly luxurious. This is the lobby of the Teddy Bear Hotel. If you’re ok with roughing it a little (even the towels were like sandpaper), this is a really friendly place to be. We take a bus to a lower temple – the driver doesn’t seem to notice that the road is full of steep switchbacks, nor that he is driving a giant bus. Disembarking, we pay for our entrance fee and a cable car ride up. Now, this is a point where I get torn about money. The bus drive was 40rmb, a two-day park ticket is 185rmb, and the cable car ride was 60rmb. 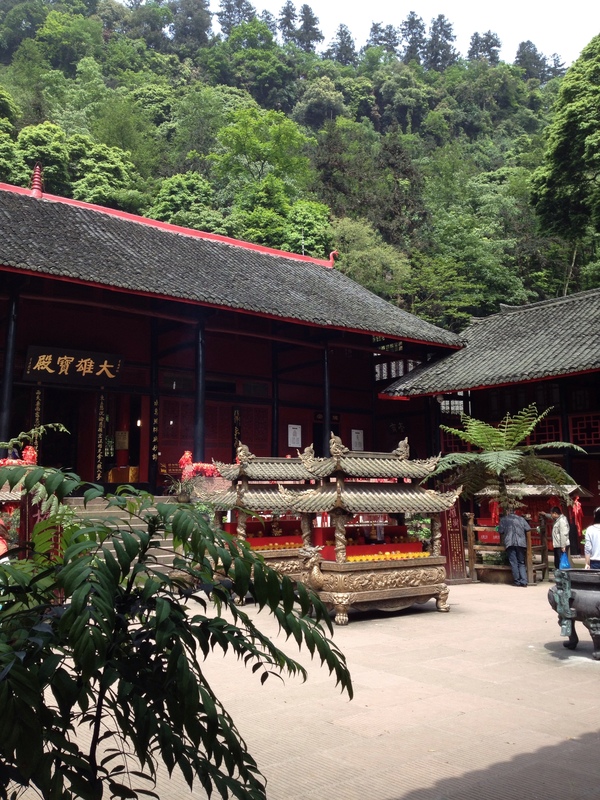 Then they tried to charge 10rmb to go into a temple which was already in the park. It adds up, and while I appreciate the upkeep needed at such a large site, there is nothing like feeling nickel and dimed to take away from any spiritual appreciation one might have for a place. It dampened my initial impression that everything cost money – at least at Disneyland they punch you in the wallet hard to start, and then you can ride any ride you want, and Disney isn’t arguably a religion. Note: this doesn’t apply to food. Both parks inflate food prices to ridiculous amounts. Instant milk tea should cost 3rmb, not 10. Food: apart from instant cup-a-noodles, you can buy corn on the cob, sweet potatoes, smoked sausages, eggs, ribs, hot dogs, Chinese tomales (dough in corn husks), steamed bread, potato shavings, pineapple skewers, and other fruit and veggies. Be prepared to pay triple what you would normally. Religious tokens – the only store I actually liked was at White Dragon Cave. Anne said there would be more stores like it, but that proved inaccurate. If you want little statues, White Dragon Cave has a good selection and surprisingly reasonable prices. White Dragon Cave – actually a temple with a holy stone inside. Also nice souvenir shop, and peaceful compared to paths. Maybe don’t shove that girl out of the way…? 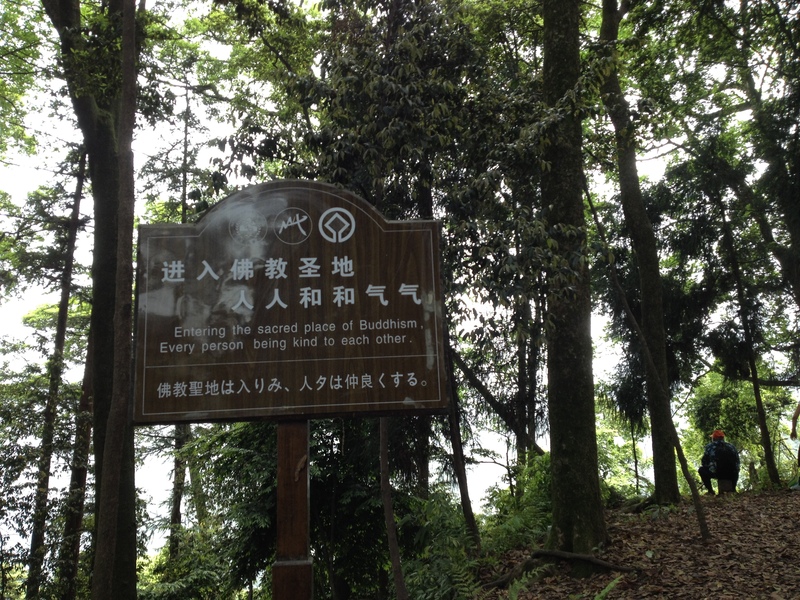 For Buddha’s sake, stop spitting on things! But the views are beautiful – can’t argue with the scenery. I’m glad for my new walking stick – I didn’t stretch and my legs start complaining before I’ve gone very far. There aren’t many temples packed in along the way. It’s a trek to White Dragon Cave from our starting point. According to my guide books, there used to be dozens of temples, but most were destroyed all those “improvements” courtesy of Mao. The fact that Emei lasted at all is a testament to the work of the monks – and the fact that it was really hard to reach this place back in the day. Still, I am happy to be out in the trees. And the water! I’ve seen mountain streams, but here the rocks and lack of algae make the water so clear it’s white! In California it’s blue and clear, but here it’s actually clear like glass. I don’t know if I’ve ever seen water so perfectly clear. Natural beauty – can’t argue with that! Then there are the monkeys, the second reason for the walking sticks. The guidebooks suggest a stick to keep them from stealing. After much walking we reach the monkey “sanctuary.” I’m not a big fan of monkeys, but they’re a big selling point of the sight. So we cross this suspension bridge, and all of a sudden Bill is flailing about. A rather large monkey has attached itself to his back unexpectedly. A woman with a stick shows up and knocks the monkey off with a series of prods and shouts. It’s unexpectedly violent looking, but the monkey doesn’t seem to mind. It goes back to poking around in pockets. I give a small monkey some corn which I picked up from the ground. It eats it, then gently climbs onto my shoulder. I don’t mind – it’s lightweight and doesn’t smell like I thought it would. I’m more surprised by the tame behavior than anything. 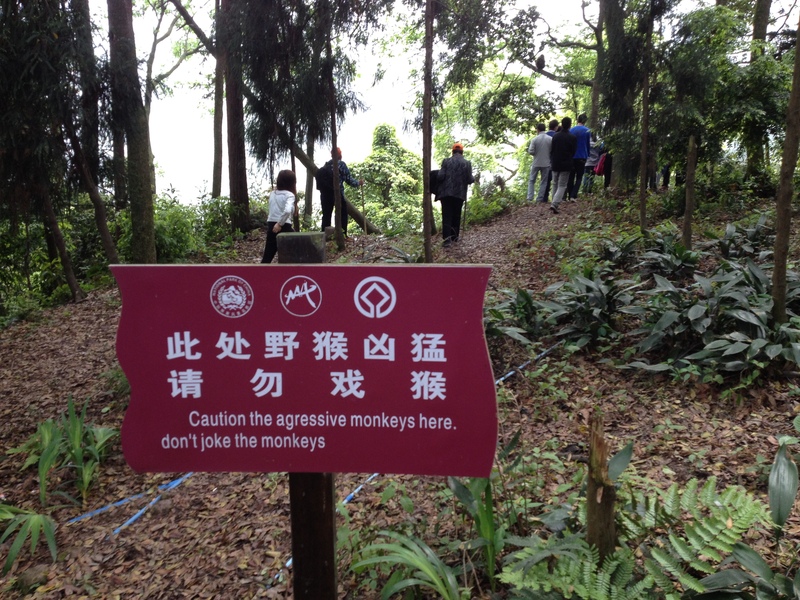 In retrospect, that monkey was the feint. I feel a larger weight on my back for a moment. “Oh, Jean, it has your…” Vega haltingly starts. “Water bottle.” I finish for him, turning. The larger monkey has neatly removed my Gatorade from the side pocket and has already punctured the bottom. Vega, concerned that I am now the monkey mark, suggests we keep moving, even though I had not really stopped. Moving doesn’t seem to stop them anyway – they are agile after all. The little monkey does not want to relinquish my arm – I’m a friendly, gullible human with a nice personality. Again, out of nowhere the woman arrives with her stick. I wish I knew enough Chinese to say I could take care of it. I’m good with animals normally – I bet I could have gotten the monkey off on my own. His larger siblings on the next suspension bridge are not fooling around, however. One grabs a woman’s sweater pocket firmly. She yelps and calls out, even though the monkey isn’t doing anything. I can see why it’s there – the woman has a packet of monkey food she bought (the aforementioned corn). The monkey wants what it has been conditioned to get. It grabs the packet and runs to a safe spot, ripping open the paper and eating the corn. I feel a weight on my back again – walking stick flipped around I calmly nudge the monkey, with a firm “Get off me, please.” The monkey does so – too easy. I check my other pocket, where I was keeping two pieces of fruit to hand out. One is gone. A second weight on my back – I don’t bother to stop the monkey, though everyone else seems greatly concerned that the American has attracted so many simians. The second piece of fruit disappears – I have to get them credit. I’ve been pickpocketed a few times, and all but once did I catch the thief in the act. These monkeys could give the best Parisian pickpockets a run for their money. I mean, I knew what they were doing, but I didn’t feel them removing the goods from my bag. The sun (a rare treat) sets as we head back to the hotel. I’m achy and tired from an improper start to the climb. Tomorrow will be tougher – I want to catch the first bus to the very top of the mountain. That’s a 5am wake up call. After dinner and some numb window shopping, I take a shower and hit the hard mattress. Look at this little urchin. Oh, I’m just a poor, poor, monkey! Let me ride on your arm while my friend here steals anything loose in your pockets. Just like a real pickpocket team, there’s the ruse and the actual thief. 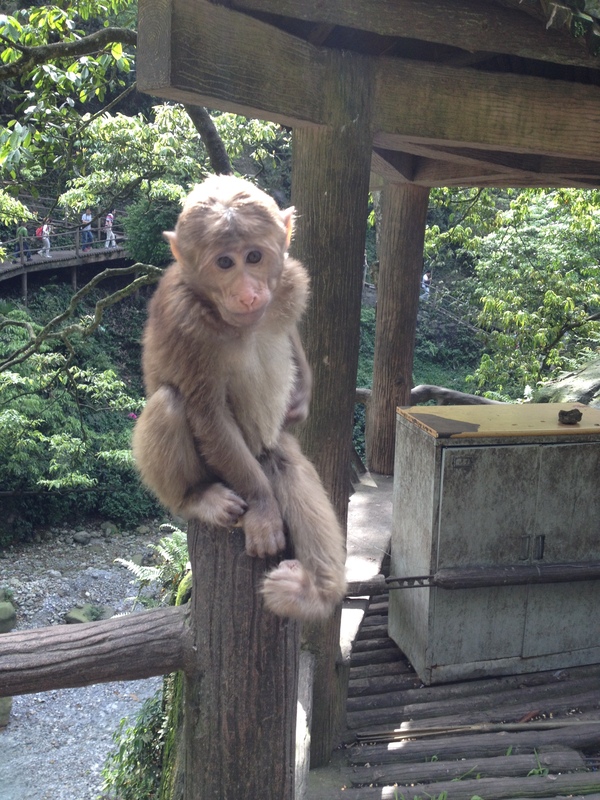 This Post was posted in Places, Travel and tagged China, Chinese tourism, Climbing, Emei Mountain, Emeishan, Hostels, Monkeys, Pickpockets, Teddy Bear Hotel, Temples, Traveling Abroad, Traveling in China, White Dragon Cave. Bookmark the permalink.